You’ve seen them everywhere: Fake quotes from scientists. They clog up our news feeds. They are plastered on t-shirts and paintings. They are the first words that our children utter (okay, maybe that’s stretching it a bit). Left: Real meme that got shared thousands of times (my addendum is added in parentheses). Right: My own awesome interpretation of the image. The quote in the image is referencing a popular quote that is frequently attributed to Albert Einstein (see the left image). 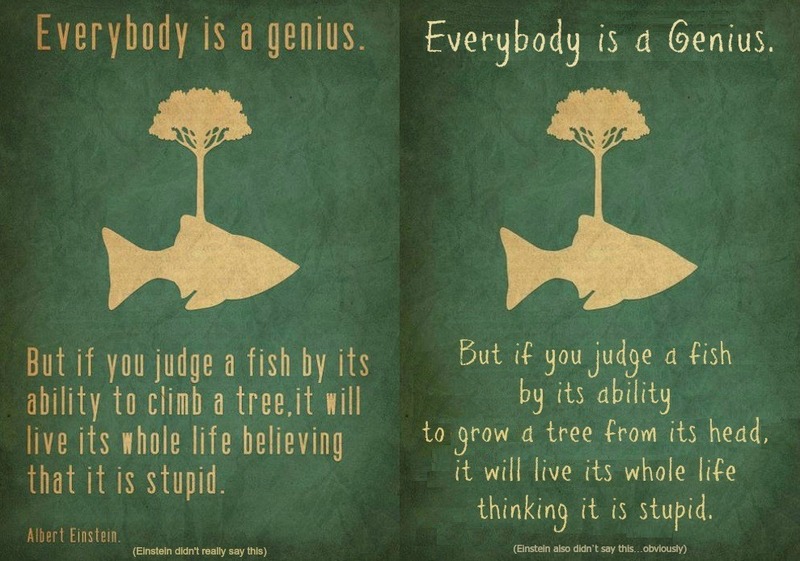 It generally reads something like, “Everybody is a genius. But if you judge a fish by its ability to climb a tree, it will live its whole life believing that it is stupid.” It’s a great quote. Unfortunately, Einstein never actually said it. The earliest appearance of this quote doesn’t come until decades after Einstein’s death. It surfaced in 2004, in the self-help book “The Rhythm of Life: Living Every Day with Passion and Purpose” by Matthew Kelly. The real quote seems to stem from an 1898 article by an individual using the pen name Aesop Jr.
It’s easy to understand the phenomenon of “Fake Quotes by Real Scientists.” All it takes is one journalist to misattribute something to a respected and much admired scientist, and the next day (because the scientist is respected and much admired), the quote is zooming across the internet at light-speed (literally). This may not seem like such a big deal. After all, what does it really hurt? I mean, if the quote is positive and helps people think about certain topics, isn’t it a good thing? Perhaps. But things like this just don’t sit with me very well. It’s almost like idolatry—like an idea can’t be good in and of itself, like we need to attribute it to a notable individual in order for it to really have value and get recognition. That said, it’s really not a huge deal. We’ve all probably shared a misattributed quote. I’m sure that I have a time or two (in fact, I know that I have). However, it’s really rather easy to prevent. Before you share, take a look at WikiQuote to verify the source. If that doesn’t help, head over to QuoteInvestigator. Those sites will tell you what book, interview etc. the quote came from, or if the quote has a dubious origin. Just remember, research before you share. It only takes a click or two.